Why Our VoIP service is Better for your Business. 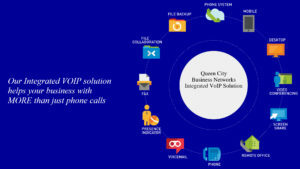 Integrated VoIP is a cloud-based unified communications and collaboration platform. We enable users to be more mobile, more productive and share ideas and content through a single system. Integrated VoIP is backed by a 99.999% network uptime SLA. Whether in the office or remote, it seamlessly integrates all your communication tools – desktop phones, mobile phones, and computers – into one manageable solution, oriented around your employee’s needs and workstyles. We help your business save time, and function more efficiently all, at economical price points. The voice network is purpose-built for reliability / Ensure you never never miss an important phone call. Automatically rings all your end points (desk phone, mobile, etc.) with every call and in the event that you don’t answer, it routes the call to any number you choose (branch office, automated attendant, mobile number, etc. ).